The globalist left is increasingly being held accountable for their destructive policies, meddling and insertion of uninvited foreign populations into what previously were stable, cohesive citizenries. The primary driving factor in their decision, along with the degradation of their quality of life in the direction of their third world occupiers, is violence against their citizens by the foreigners. Cottbus, is approximately 75 miles southeast of Berlin and has been hit hard by the Islamist violent crime explosion. Earlier this week the Brandenburg State Police reported that two Syrian teenagers, both males, had been arrested for knifing a 16-year-old German teenager in the face at a tram station. There’s a promising option, issue a million and a half negative residency permits across Germany and their problem can begin to go away. Of course the leftists won’t admit that their precious Trojan horse invaders are the problem, but with 3,000 of them now burdening their community, reality is speaking loudly on its own. The propaganda media in Germany have been quick to label citizens defying their corrupt globalist-hijacked government as neo-Nazis, which they have done in this instance too. It’s similar to their counterparts in the US labeling President Trump and his supporters as racists for defending our nation. The history of Germany allows them to instill extra levels of fear as well as to attempt to shame patriots for opposing their takeover. What is described by the propagandists as “a community group” told local media that a group of “neo-Nazis” had assaulted refugees on the morning of New Year’s Day, though no police report or other substantiation was offered. They also stated that last weekend a group of around 100 “masked neo-Nazis” marched in an illegal demonstration through the city centre. The reason demonstrations by the citizens are illegal is that the government has concocted a “right not to be identified as hostile foreign enemies of the state” that is being extended to their foot soldiers, the Islamists. Free Speech has been deemed hate speech and made a crime, with jail and fines as the punishment. In order to be protected from the tyranny of the Merkel government’s hostility towards the German people, masks are required. The label “German patriots” would apply more aptly to the marchers, but Neo-Nazi carries with it negative connotations and is a means for the illegitimate government and their allies to smear their political opponents. Additionally, the city plans to increase their video surveillance capabilities of the central downtown square and to add both uniformed and plain-clothes police officers, as well as ten new social worker positions throughout their school system. All of these expenses are being incurred by the local townspeople as the result of the forced imposition of idiotic, destructive policies upon the common folk by the globalist Merkel, her EU masters and George Soros. MERKEL AND HER GOVERNMENT ARE SO DEEP IN CORRUPTION AND IT IS SO OBVIOUS !!! I BELIEVE THE ENTIRE EUROPEAN GOVERNMENT IS TOTALLY CORRUPT AND OWNED BY THE GLOBALIST !!!! 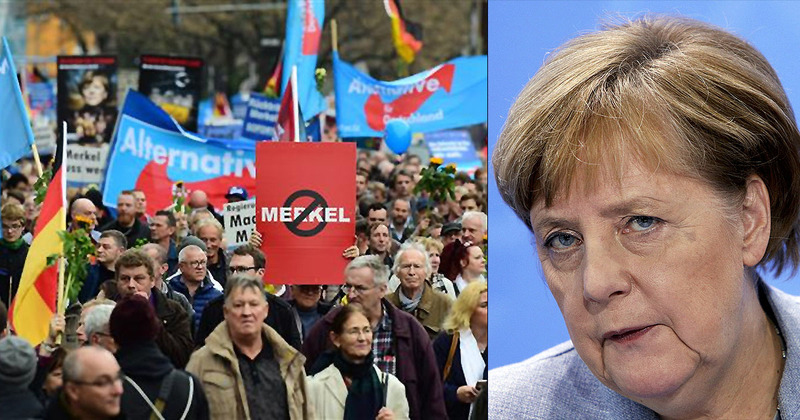 GO GERMANS GO GET MERKEL AND HANG HER BY HER COMMUNIST NECK !!!!!!!! You cannot take primitive people from a Medieval master/slave society and put them in a 21st century environment successfully ! where is a ADOLF HITLER when ya need one lol. the German people should RISE UP and REMOVE THAT STUPID WHICH, then DEPORT ALL MUSLIMS.